At this point, this website really should be called “A Progressive for Nuclear Progress,” because so far it is just me, Eric Schmitz. I am not a nuclear professional or expert. 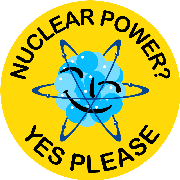 Rather, I think of myself as something of a “cheerleader” for the advancement and expansion of nuclear energy, hoping to appeal to the American political left and bring more of us on board in support of new and existing nuclear technology. An engineer by education and career, I do have an engineer’s aptitude for understanding the ins and outs of this subject, and I hope I can manage better than an engineer’s typical aptitude for communicating the things that I have learned and continue every day to discover. This is (still) a very new blog. Although I set it up last Fall (2012) and made one “test” post at the time, I have not gone much further with it until just the past couple of weeks. What I mostly expect to do for starters is to post links to other articles that I find online, along with my own thoughts about those articles. Hopefully I will soon get to posting some more original content now and then. Comment policy: All comments are moderated. I’m not a big fan of open comment threads. I welcome friendly and supportive comments and helpful references (links). Trolls or any persons here to pick a fight or be confrontative will probably not see their comments approved. I am a cheerleader, not a professional or expert, I have picked my team, and I am entirely open about that. If you want to cheer for some other team, or tear down mine, you will not be doing so on my side of the field. New comment policy (30 April 2014): If you want to comment, you will need to create an account before doing so. I’m tired of having to get rid of all the spam.